This article first appeared in the Rushville Republican on Tuesday, February 1, 2017. According to the statistics heart disease is the number one health issue and cause of death in Rush County. 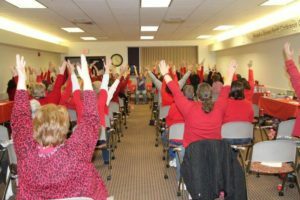 The Rush Memorial Hospital Foundation’s Seed Circle will be sponsoring their 3rd annual “Show Us Your Red“ for Heart Health on Saturday, February 4, 2017. The event will be held at the Kenneth L. Earnest Family Conference Center located on the ground floor of the RMH Medical Office Building (110 East 13th Street, Rushville) from 10am to noon. This free event is open to the public and will showcase information about heart health for men and women. Information tables for attendees to browse will include: RMH Radiology Department, RMH Cardiology Department, Jake McKee Heart of Gold, Omni Home Health Care, Anytime Fitness, Weight Watchers, CVS Pharmacy, Rush2Health & Purdue Extension, RMH Foundation, Knightstown Family Fitness, and Michelle Gratzer – KEEP Distributor. A healthy cooking demonstration, led by RMHF Intern Katie Meyer, and chair yoga conducted by Monica Hamill, owner of Twin Oaks FLOW, will keep the attendees entertained and participating. The featured speaker this year is Niki McKee, who will address the importance of heart screening in a presentation entitled “The Heart Truth”. Niki and John McKee along with their and family are the founders of the Jake McKee Heart of Gold Fund established with the RMH Foundation. This fund provides heart screenings free of charge for children in 6th through 12th grade. Every attendee will receive a goody bag to collect valuable information concerning heart health and will be entered for prizes. The event is a wonderful way to ask questions and get information that is pertinent to good heart health. Make plans to attend and don’t forget to wear red. Show your healthy heart spirit and bring your family and friends. Doors open at 10 a.m.